The latest news, going beyond the headlines to see how lives are affected by the world around them. An employee works on the fuselage of a Boeing 737 MAX 9 test plane outside the company's factory in Renton, Washington, on March 14, 2019. The 737 MAX, Boeing's newest model, has been been grounded by aviation authorities throughout the world after the crash of an Ethiopian Airlines 737 MAX 8 on March 10. U.S. prosecutors are looking into the development of Boeing's 737 Max jets, a person briefed on the matter revealed Monday, the same day French aviation investigators concluded there were "clear similarities" in the crash of an Ethiopian Airlines Max 8 last week and a Lion Air jet in October. The Justice Department probe will examine the way Boeing was regulated by the Federal Aviation Administration, said the person, who asked not to be identified because the inquiry is not public. A federal grand jury in Washington sent a subpoena to someone involved in the plane's development seeking emails, messages and other communications, the person told The Associated Press. 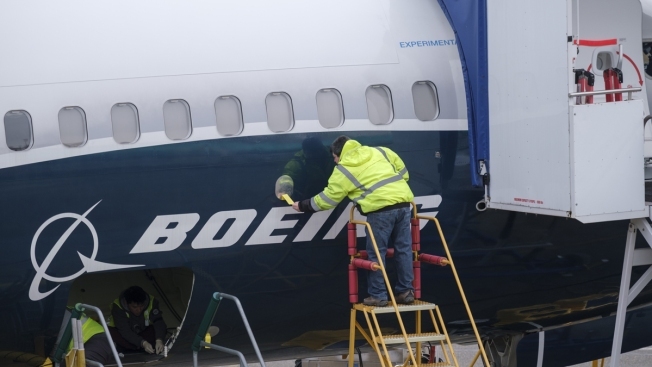 The Transportation Department's inspector general is also looking into the FAA's approval of the Boeing 737 Max, a U.S. official told AP. The official wasn't authorized to discuss the matter publicly and spoke on condition of anonymity. The Wall Street Journal reported on the probe Sunday said the inspector general was looking into the plane's anti-stall system. It quotes unidentified people familiar with both cases. Boeing has promised an urgent fix to flight control software in its grounded 737 Max planes, days after the crash of an Ethiopian Airlines 737 Max killed all 157 people on board. American pilots made at least five complaints last fall about autopilot issues causing the planes to make a sudden nosedive during takeoff. The anti-stall system may have been involved in the Oct. 29 crash of a Lion Air jet off of Indonesia that killed 189 people. It's also under scrutiny in the March 10 crash of an Ethiopian Airlines jet that killed 157. The Transportation Department's FAA regulates Chicago-based Boeing and is responsible for certifying that planes can fly safely. The grand jury issued its subpoena on March 11, one day after the Ethopian Airlines crash, according to the person who spoke to The Associated Press. Spokesmen for the Justice Department and the inspector general said Monday they could neither confirm nor deny the existence of any inquiries. The FAA would not comment. "Boeing does not respond to or comment on questions concerning legal matters, whether internal, litigation, or governmental inquiries," Boeing spokesman Charles Bickers said in an email. The company late Monday issued an open letter from its CEO, Dennis Muilenburg, addressed to airlines, passengers and the aviation community. Muilenburg did not refer to the reports of the Justice Department probe, but stressed his company is taking actions to ensure its 737 Max jets are safe. Those include an upcoming release of a software update and related pilot training for the 737 Max to "address concerns" that arose in the aftermath of October's Lion Air crash, Muilenburg said. The planes' new flight-control software is suspected of playing a role in the crashes. The French civil aviation investigation bureau BEA said Monday that black box data from the Ethiopian Airlines flight showed the links with the Lion Air crash and will be used for further study. Ethiopian authorities asked BEA for help in extracting and interpreting the crashed plane's black boxes because Ethiopia does not have the necessary expertise and technology. The Ethiopian Accident Investigation Bureau intends to release a preliminary report within 30 days. The United States and many other countries have grounded the Max 8s and larger Max 9s as Boeing faces the challenge of proving the jets are safe to fly amid suspicions that faulty sensors and software contributed to the two crashes in less than five months. Both planes flew with erratic altitude changes that could indicate the pilots struggled to control the aircraft. Shortly after their takeoffs, both crews tried to return to the airports but crashed. Boeing has said it has "full confidence" in the planes' safety. Engineers are making changes to the system designed to prevent an aerodynamic stall if sensors detect that the jet's nose is pointed too high and its speed is too slow. Investigators looking into the Indonesian crash are examining whether the software automatically pushed the plane's nose down repeatedly, and whether the Lion Air pilots knew how to solve that problem. Ethiopian Airlines says its pilots received special training on the software. Dennis Tajer, an American Airlines pilot and a spokesman for their union, said Boeing held a discussion with airlines last Thursday but did not invite pilots at American or Southwest, the two U.S. carriers that use the same version of the Max that crashed in Indonesia and Ethiopia. Tajer said airline officials told the unions that Boeing intends to offer pilots about a 15-minute iPad course to train them on the new flight-control software on Max jets that is suspected of playing a role in the crashes. He called that amount of training unacceptable. "Our sense is it's a rush to comply — 'let's go, let's go, let's go,'" Tajer said. "I'm in a rush to protect my passengers." A spokesman for the pilots' union at Southwest Airlines also said Boeing representatives told that union they expected the upgrade to be ready the end of January. The spokesman, Mike Trevino, said Boeing never followed up to explain why that deadline passed without an upgrade. Boeing was expected to submit a proposed fix to the FAA in early January. Krisher reported from Detroit. Associated Press writers David Koenig in Dallas and Michael Balsamo in Washington contributed to this report.